Find artworks, auction results, sale prices and pictures of Thomas Gainsborough at auctions worldwide. PORTRAIT OFEDWARD WILLES (1723-1787), THREE-QUARTER LENGTH, WEARINGJUDGE'S ROBES AND WIG Thomas Gainsborough, R.A. SUDBURY 1727 - 1788 LONDON oil on canvas 53 1/2 by 43 3/8 in. ; 136 by 110.2 cm. Provenance By descent in the sitter's family to his great grandson George Willes (1841-1927); His sale, London, Christie's, 26 May 1894, lot 78,for 360 Guineas,to Colnaghi; Possibly from whom acquired by Colonel George Dudley Smith of Earle's Croome or acquired by his son, Osbert Dudley Smith (b. 1898), at a later date; Thence by descent until 1979; By whom sold ("Property of a Lady"), London, Christie's, 23 November 1979, lot 107; Anonymous sale ("Property of a Gentleman"), London, Sotheby's, 19 November 1986, lot 57; WithThomas Agnew & Sons, London; WithRichard L. Feigen & Co., New York; From whom acquired by the present collector. Exhibited Birmingham, United Kingdom, Birmingham Museum and Art Gallery, Works of Art from Midland Houses, 18 July - 6 September 1953, no. 29. Literature Literature D'Anvers,Thomas Gainsborough: A record of his life and works,London 1897, p. 115; W. Armstrong,Gainsborough and his Place in English Art, London &New York1898, p. 204; O. Barron,Northamptonshire Families,London 1906, reproduced p. 348; E. Waterhouse, "Preliminary Checklist of Portraits by Thomas Gainsborough", inWalpole Society, vol. XXXIII, Oxford 1953, p. 113; E. Waterhouse,Gainsborough, London 1958, p. 96, cat. no. 724, reproduced, plate 233. The Portrait Surveyed: British Portraiture 1670 – 1870, exhibition catalogue, London 1980, p. 4, cat. no. 2. J. Ingamells,"Current and Forthcoming Exhibitions", inThe Burlington Magazine, vol.CXXII, no. 927, London 1980, p. 444. Catalogue Note Edward Willes was a barrister, politician, and judge. 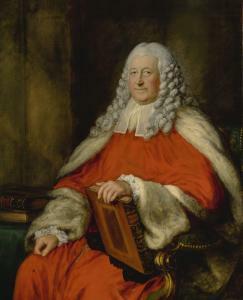 His father, Sir John Willes (1685-1761), was Chief Justice of Common Pleas and helped launch his son's career. In 1741 he joined the Honourable Society ofLincoln's Inn, one of the fourInns of CourtinLondonto whichbarristersofEngland and Walesbelong. By 1747,Willes was already in the House of Commons, sitting first for Old Sarum, and then for Aylesbury until 1754. During this time he supportedFrederick, Prince of Wales and opposed the ministry on Henry Pelham. Willes married in 1752 to Anne, daughter of the Reverend Edward Taylor of Sutton, Wiltshire, and together had three sons. In 1756 he was appointed King's Counsel, and then became a justice of the Court of King's Bench from 1768 until his death in 1787. Before becoming a justice, Willes was a member of parliament for Leominster from 1767 to 1768. This portrait, which wasmade in 1786, just a year before the sitter's death, appears to be listed in his will.1 Several prints were made after this painting well into the 19th century, which attest to its popularity(fig. 1). 1. E. Waterhouse, Gainsborough, London 1958, p. 96, cat. no. 724. Thomas Gainsborough, R.A. (Sudbury, Suffolk 1727-1788 London) Portrait of Winifred Silvertop, Mrs John Wright (d. 1780), bust-length, in Van Dyck dress with a blue gauze wrap Thomas Gainsborough, R.A. (Sudbury, Suffolk 1727-1788 London) Portrait of Winifred Silvertop, Mrs John Wright (d. 1780), bust-length, in Van Dyck dress with a blue gauze wrap oil on canvas 30 ¼ x 25 in. (76.5 x 63.5 cm.) in a fine English 18th century carved giltwood frame Provenance (Probably) commissioned by the sitter\’s father, George Silvertop (1705–89), and by descent in the Silvertop family of Minsteracres, Northumberland. with Covent Garden Gallery, London, by the 1970s. Literature To be included in Hugh Belsey\’s forthcoming catalogue of the artist\’s work, no. 962. 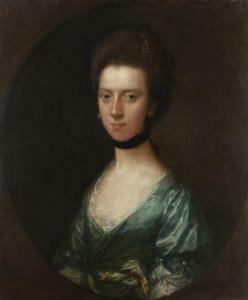 The sitter was the daughter of George Silvertop (1705-89) of Minsteracres, Northumberland, and his first wife, Bridget, daughter of Henry Whittingham. In 1762 she married John Wright (1740-1792) of Kelvedon Hatch, Essex, with whom she had two sons. This hitherto unrecorded portrait, which was probably painted to mark her marriage, shows the sitter in Van Dyck dress. The flying drapery, a distinctive feature of the Flemish artist\’s portraiture, was rarely employed by Gainsborough but can be compared with his portraits of Mrs Chetwynd and Mrs Craddock (both Private collection), both of which date to the artist\’s early years in Bath. Interestingly, the sitter\’s choker of glass bugle beads, secured with a white ribbon, appears to have replaced a falling lace ruff that was tied with a bow at the nape of her neck. We are grateful to Hugh Belsey for his assistance with this catalogue entry. 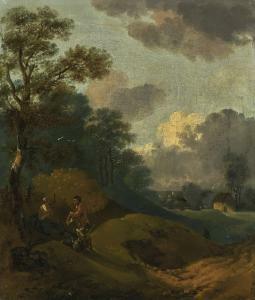 WOODED LANDSCAPE WITH PEASANTS RESTING,AND A DISTANT COTTAGE Thomas Gainsborough, R.A. SUDBURY 1727-1788 LONDON oil on canvas 35.6 x 30.6 cm. ; 14 x 12 in. Provenance Joshua Kirby (1716–74); The Rev. Henry Scott Trimmer; His posthumous sale, London, Christie's, 17 March 1860, lot 51, for £15–4s–6d. to Rutley; G.A.F. Cavendish Bentinck, M.P. (1821–91); His posthumous sale, London, Christie's, 8–18 July 1891, 4th day, lot 549, for £52–10s–6d. to Gooden; Thence byinheritance to the present owner. Exhibited London, Royal Academy,Winter Exhibition,1890, no. 4. Catalogue Note Another version of this composition is recorded in John Hayes' catalogue raisonné of the artist's work, and dated circa 1748–50.1We are grateful to Hugh Belsey, who supports the attributionto Gainsborough following first-hand inspection, and notes that it was not unusual forthe artist to produce multiple versions of his compositions early in his career. The upper right sky, lower right landscape, and the seated figure leaning backwards towards the viewer are especially typical of the artist'stechnique from this period. 1J. Hayes,The Landscape Paintings of Thomas Gainsborough, 1982, vol. II, pp. 355–56, cat. no. 27, reproduced p. 356, fig. 27. Thomas Gainsborough, R.A. (British, 1727-1788) "Portrait of Gainsborough Dupont (1754-1797), the Artist's Nephew", ca. 1772-74 oil on canvas unsigned. Antique giltwood frame with oval aperture. 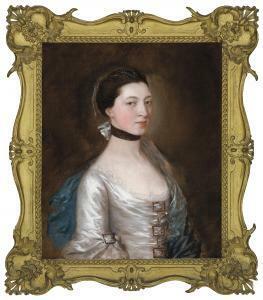 25" x 20", framed 30" x 25" Provenance: Mrs. S. E. Browne by 1856; bequeathed by Miss Emily Sarah Browne, High Wycombe to Mansfield College, Oxford, 1906; Christie's, January 29, 1954, lot 128; Newhouse Galleries, New York; Private collection, Chicago; Fine Arts Gallery, New Orleans, 1984; Estate of Dr. Carroll Ball, Jackson, Mississippi. Literature: To be included in Hugh Belsey's upcoming catalogue raisonne of the artist's portraits. Notes: The most interesting member of Gainsborough's family is one of whom curiously little is known: I mean his sister's son, Gainsborough Dupont... He seems to have become a member of the Gainsborough household at an early age... 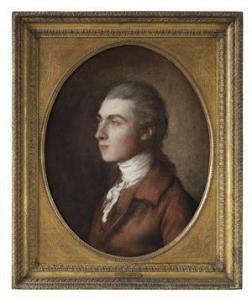 He made good use, however, of his uncle's tuition... Walter Armstrong Gainsborough Dupont, the eldest son of Thomas Gainsborough's sister, entered his uncle's studio in 1772, remaining there until the elder artist's death in 1788. He was, somewhat surprisingly for the time and for an artist of Gainsborough's caliber and reputation, the only assistant accepted by the elder man. While Dupont did briefly attend the Royal Academy School of Art, he received most of his artistic training from his uncle, with the result that he adopted many of Gainsborough's stylistic methods. Gainsborough painted his nephew several times, and a portrait very similar to the one presented here is conserved at the Tate, Britain. Both of these portraits, with their eyes of reflective translucence, softly rounded cheeks and chins, hint at the youth and frivolity which contemporary accounts attribute to the personality of the young man. Reference: Walter Armstrong Gainsborough and His Place in English Art, London: William Heinemann, 1898. We would like to thank Mr. Hugh Belsey for his help in cataloguing this portrait.